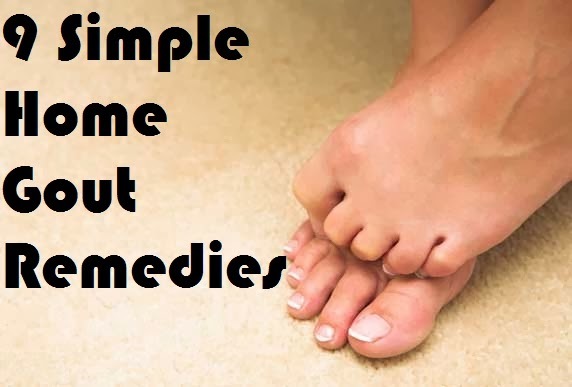 There are many home gout remedies that can help to get rid of gout. Here you'll discover nine natural gout remedies you can try at home. Gout is a form of arthritis which can occur in anybody although it happens much more frequently in men than in women. The majority of cases occur in the big toe, but gout can also appear in the knees, ankles, feet, elbows, wrists and hands. Typical symptoms are swelling, inflammation, redness, stiffness and warmth in the joints. Gout is caused by high uric acid in the blood (called 'hyperuricemia') which results in urate crystals being formed in the joints. High uric acid levels are the result of either an overproduction of uric acid by the body, or a reduction in the amount of uric acid being eliminated by the kidneys. 1. Rest: The first home gout remedy is to take plenty of rest with the affected joint in an elevated position. 2. Ice: Apply ice packs on the affected joint to help the pain and inflammation. 3. Lose weight: Being overweight is one of the highest risk factors for gout, so get to your optimum weight through a sensible diet and daily exercise. 4. Drink plenty of water: This home gout remedy is very important -- drinking 2 to 3 litres of water per day helps your kidneys flush excess acid out of your system and prevents crystal formation. 5. Avoid drinking alcohol: You should avoid alcohol completely because alcohol (especially beer) is a confirmed key trigger for gout. 6. Limit purine foods: You should limit the intake of high-purine foods, such as shellfish, organ meat, game and fatty red meat, because these types of foods can raise uric acid levels in your body. 7. Cherries: You can eat fresh cherries or drink tart cherry juice. This is one of the best home gout remedies because cherries have natural anti-inflammatory and uric acid reducing properties. 8. Apple cider vinegar: Mix one or two teaspoons of apple cider vinegar with water and then drink it two or three times a day. It is thought that this can change your body pH and so help alleviate high uric acid. 9. Juniper berries: Juniper berries contain compounds that help to prevent uric acid crystallization. It's probably best taken in capsule form from health stores.